The report of Ukrainian media watchdog StopFake “Fake Narratives in Times of Presidential Elections: How Hybrid War Reshapes The Agenda of Ukrainian TV“ by Anastasiya Hrynko with contributions from Artem Laptiev focuses the fake narratives spread by Ukrainian opposition TV channels during the 2019 presidential election campaign. The study is based on one-month long monitoring of talk shows on two channels, NewsOne and 112. The authors analyzed the themes of the shows aired on both channels and found that they both spread typical narratives of Russian propaganda. StopFake’s newest research analyzes the content of talk shows on two Ukrainian opposition TV channels, NewsOne and 112. 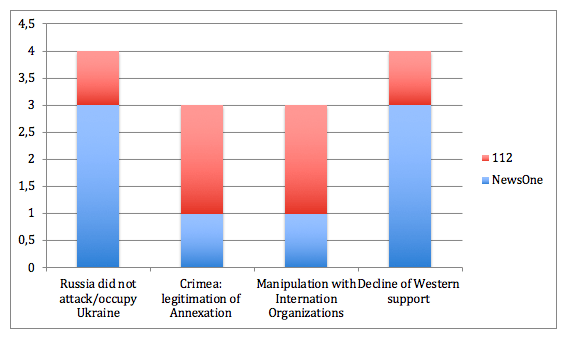 And the researchers have found that the oppositional TV channels tend to give airtime to promoting Ukraine-related fake narratives that are mostly centered on Ukrainian domestic agenda issues. 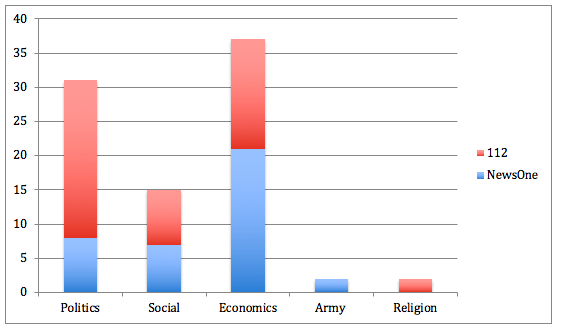 The two channels were picked for the analysis because both 112 and NewsOne were previously criticized by the independent media watchdog Detector Media and the National Council of TV and radio broadcasting for their utilization of hate speech, disseminating of fakes, and “setting agenda that is too close to Russian propaganda.” Importantly, the political talk shows of the oppositional TV channels faced the strongest criticism. Top-3 Fake Narratives on 112 and NewsOne in December 2018. 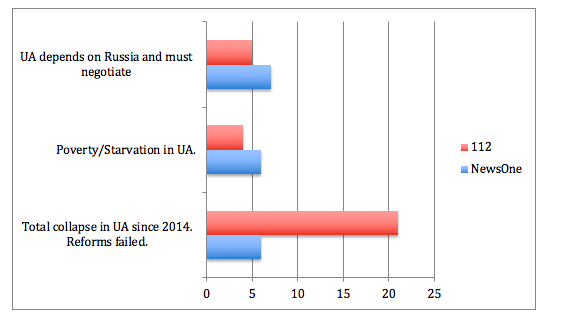 In many cases, these narratives “appealed to emotions and fake claims intending to depict Ukraine as a totally ruined country sinking into poverty (again, as a result of the ineffective government) claiming that to survive “Ukraine must negotiate with Russia,” the study says. Meanwhile, mentioning the Western stakeholders, both channels promoted the fake narratives of the “decline of Western support for Ukraine” and manipulated data on international organizations. Opposition MPs and guests of the shows who were introduced as “experts” were most active in voicing propaganda narratives. Themes in which fake narratives were embedded. “Sanctions against Russia do not work” (NewsOne). “Old and weak Europe intends to take the territory of Ukraine” (112). “The united Ukrainian church has been created as a result of aggressive actions and pressure from the side of Ukrainian government” (112). As we can see, NewsOne and 112 channels prefer Russian propaganda narratives that are mainly directed against the Ukrainian government and its policies. It is noteworthy that the idea of “impoverished Ukraine” which should negotiate with Russia to survive is widely used by many presidential candidates as a cornerstone of their campaigns: all populists refer to poverty and promise to raise salaries and pensions, as well as they often promise to halve gas prices. As well as they insist on negotiations in various forms, such as changing negotiation formats (Tymoshenko), negotiating with Putin face-to-face and to “agree somewhere at a middle point” (Zelenskyi), direct talks to not only Russia but also to the representatives of the so-called Luhansk and Donetsk people’s republics (Boiko). Meanwhile, more than enough negotiation platforms have already been used for negotiations – the Normandy Format, “Minsk Group,” meetings of special representatives of Russia and the US – the only problem is Russia’s unwillingness to obey the paragraphs of the Minsk agreements and de-occupy the Ukrainian territories.